Having a Preventative ethos at Smile Essential dental practice, we recommend regular dental health checks as advised by your Leicester dentist This is because detecting decay at an early stage can prevent excessive tooth damage and when cavities are small, they are much easier, less painful and cheaper to treat. Here at Smile Essential in Leicester, tooth decay detection is the most important preventative dental care procedure we provide for helping to help maintain good dental health. When performed by our talented dentists, decay detection is completely painless and performed using powerfully lit magnification tools and a series of x-rays. In its early stages, tooth decay does not tend to show many physical signs and can often not cause any pain or sensitivity. Sometimes the tooth looks visually healthy, but taking an x-ray of your teeth allows us to determine whether you have any decay under the enamel, any possible infections in the roots, or any loss of bone around the tooth. Tiny spots of decay can be identified and treated before any real damage is done. Prevention is the key message and through regular dental examinations, we can ensure you avoid serious dental health problems and the extensive treatments they may require. The most common places for decay for children and adults can often start in the areas between the teeth - and this is one of the main reasons you should floss or use interdental brushes daily. The little pits and grooves on the chewing surface of the back teeth are also a troublesome area. Placing a white filling in the cavity can usually treat tooth decay. If left untreated, decay can eventually lead to the tooth dying and infection spreading under the root, causing a dental abscess. 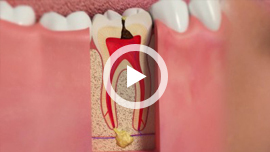 This may then need a root filling to treat the problem, or even an extraction of the tooth. Are you worried about a decayed tooth or teeth? Call us now on 0116 2891317 for expert guidance and assistance.